This unit is Sorolla. Sorolla is a lovely, large, 1 bedroom apartment on the ground floor. It has a huge, wonderful sunny terrace. The bedroom has twin beds that can be made into a super king on request. There is a modern, en-suite bathroom. A cot and high chair are available. The living room has a double sofa bed. The apartment will accommodate 4 people. The living room door opens on to the terrace and there is a serperate kitchen. Wifi, hot/cold air conditioning and UK/European television channels are provided. Artemarina is right by Puerto Marina and the sandy beach! Artemarina is an exclusive group of apartments in a wonderful residential area. In Puerto Marina you will find a wonderful variety of bars, restaurants and shops. Picture yourself watching the world go by whilst having a coffee or glass of wine under blue skies and sunshine! Artemarina has all that you need for your holiday. There are just 6 fabulous apartments, recently renovated. Perfect for family groups, golfers or the individual traveller. Each apartment is named after a famous Spanish artist. At Artemarina are : 1 x 3 bedroom apartment, 2 x 2 bedroom apartments, 3 x 1 bedroom apartments. Each apartment has a sunny terrace and patio furniture. Please see the description for each apartment for details. You'll not find better quality apartments in such a fantastic location! High speed Internet & Wifi. Hot/cold air-con. Laundry facilities. BBQ, UK and European TV channels are all provided. The price includes full clean on arrival and departure, weekly bathroom and bed linen change. Additional cleaning and linen service can be provided if required - please request price. 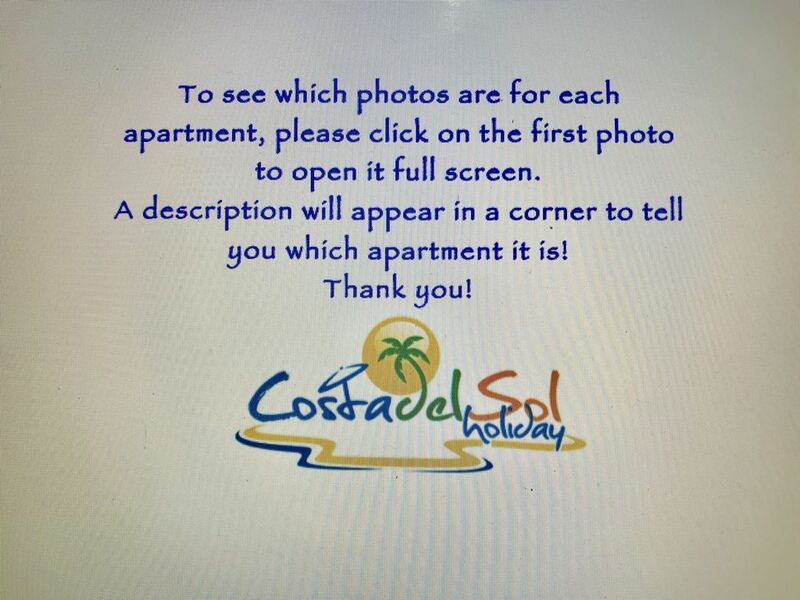 Here is some information about the local area - you can see more on my website costadelsolholiday. You'll be within 2 minutes walk to the sandy beach and Puerto Marina. You can also walk to the Sea Life Centre, Tivoli World, cable car, Selwo Marine Centre, shops, huge selection of restaurants. From Puerto Marina you can take boat trips along the coast or dolphin watching - or just stroll along and enjoy the wonderful atmosphere! The promenade connects up the Castillo de Bil Bil right along to Torremolinos, passing through Puerto Marina and La Carihuela. There are some excellent local bars and chiringuitos to stop at whilst you stroll along enjoying the sunshine and wonderful sea views. An easy walk from the villa is to Parque Paloma. A great, free, day out for all the family - lots of play areas for kids and a mini zoo. You can walk back along the promenade if you like and enjoy excellent tapas in any of the beach restaurants! You can get a taxi or bus to the local Water Park and to the Crocodile Park. Or, an excursion to Mijas, Ronda, Granada, Cordoba, Gibraltar..... These can be booked locally and there is an information file in the villa to help you. There is a huge selection of great things to do! Excursions can be arranged locally. Car hire is not necessary. We live in Spain. Miguel is Spanish, from Malaga and Jennifer is British. We like to be hands on to be sure everything is just right! LOCATION!! Artemarina has something very special. Back in 1980 Jennifer's mum bought her first apartment here. It's been part of our lives for many years! Lots of changes! Hot/Cold air conditioning. Additional gas heater for winter if required. Artemarina is ideal for family groups if required. There is a maid service between lets and fresh linen is provided weekly. There are 6 apartments at Artemarina. If one apartment is not available for the duration of your stay, it may be possible to switch to another part way through - or I may be able to accommodate your dates anyway - always worth asking! Excellent apartment in a great location - handy for everything. Everything was as advertised on the site with very clear instructions for access etc. All the amenities you would need were available and everything was very clean. Great place for a break. Thank you - I'm so glad you had such a lovely holiday at Artemarina! We had a lovely week thankyou and were fortunate with the weather too. As we had been before we had a smooth journey knowing how to get there. We may well book again next year if our friends are booking too. Many thanks - we really appreciate our regular visitors and hope to see you again very soon! Very impressed with ARTEMARINA. Just returned from a one week stay in apartment SOROLLA. We found the apartment very clean and had everything we needed for our break. Located a few minutes from the marina.Really enjoyed our stay and will definitely return. That's great - so glad you had such a wonderful time and hope to see you again soon! This is the third time we've stayed at these apartments,and each time they have been spotlessly clean and well maintained.would highly recommend. Wonderful - thank you so much and we are looking forward to your next visit! We really enjoyed our stay at the Artemarina Apartments. Very spacious rooms and clean. Near to the beach and the marina, with lots of bars and restaurants. Benalmadena is a lovely place to go for a holiday. Will be back again! Wonderful - so glad you had such a wonderful time! Looking forward to seeing you again! Excellent location, very central to all possible needs. Apartment very well maintained and spacious. Owner very responsive to any queries. Wonderful. Thank you! Looking forward to your next visit. Benalmadena Costa is an excellent location for a family holiday or golf breaks on the Costa del Sol! We are an easy drive from Malaga Costa Del Sol Airport also known as Pablo Ruiz Picasso Airport. From all my properties you can walk to Puerto Marina, visit the bars & restaurants and the sandy beaches of the Costa del Sol. See the mountains of the Sierra Nevada whilst swimming in the sea! You will be in an ideal location to visit the Alhambra in Granada and beautiful local towns such as Mijas and Ronda. Don't miss a visit to Malaga to visit the Picasso Museum, and a chance to sample tapas and Malaga Dulce vino! Excursions an be arranged locally. Within an easy walking distance are local shops, restaurants and many tourist facilities. Visit Sea Life Centre in Benalmadena, Selwo Marina, Tivoli World, or visit nearby Torremolinos for the Aqua Park and Crocodile Park. For golfers this is the 'Costa del Golf' - to name a few nearby clubs: Torrequebrada Golf; Valderrama Golf, Benalmadena Golf; Mijas.